To better understand the energy benefits of a rooftop garden, it's important to understand the concept of an urban heat island, the increase in temperature that's found in virtually all urban areas. Solar radiation warms up concrete, asphalt and other man-made materials much faster and hotter than it warms trees, plants, and greenery. The result is a big zone of hot air – a heat island – surrounding urban environments year-round. While this helps to keep cities warm in winter, the urban heat island makes cities and towns sweltering hot in summer, which means air conditioners and other cooling equipment have to work harder and longer. The resulting spike in energy demand puts a real strain on electrical grids and can send summer energy bills through the roof. A roof garden, however, can ease the burden on homes and commercial buildings. A study by the National Research Council of Canada found that an exposed roof can get as hot as 158 F on a sunny day; an identical roof, when covered by a green, shady roof garden, stays relatively cool at just 77 F.
In addition to energy savings, roof gardens have a beneficial effect on roofs themselves. Most roofs, exposed as they are to sun, wind, snow, and rain, go through rather large variations in temperature. These extreme temperatures cause the roof membrane to shrink in cooler weather, and expand in hot weather. All this shrinking and swelling takes a toll on the roof, shortening its lifespan, but rooftop gardens can help. In the Canadian research noted above, the bare roof experienced daily temperature fluctuations of 83 F; the roof gardens reduced this variation to just 22 F. When the city of Roanoke, Va., installed a green roof on its municipal building — at a cost of $123,000 — it added 20 to 60 years to the life of the current roof. When the Canadian researchers compared the runoff from a bare roof and a rooftop garden, the difference was astounding: The roof garden reduced the amount of runoff by 75 percent and delayed the run-off time by 45 minutes. For wastewater systems that routinely discharge raw sewage after a rainstorm, this finding is big news. Though the researchers didn't measure the water quality of the runoff, advocates of green roofs and roof gardens claim that the rainfall running off a bare roof contains many pollutants like petroleum-based volatile organic compounds (VOCs). But when rainfall is captured by a covering of trees and plants, then filtered through the plants' soil, it contains fewer harmful pollutants. Besides the environmental and financial benefits of roof gardens, there's another benefit that's more difficult to quantify: the age-old pleasure of gardening itself. 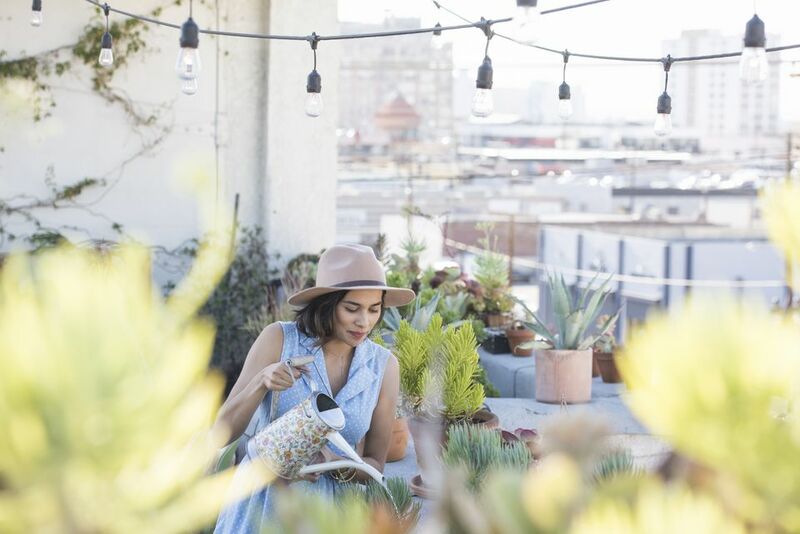 Especially in urban areas — where farmland is rare if not nonexistent — creating a rooftop garden holds the irresistible promise of fresh fruits and vegetables, as well as quiet, green spaces for relaxation and recreation. Different municipalities have different degrees of permitting and other requirements before a roof garden or green roof can be installed. Many of these government officials, however, are coming to realize that the energy savings, the reduction in stormwater and other benefits of roof gardens greatly outweigh the risks. Chicago and New York City, for example, are actually encouraging the installation of roof gardens throughout their cities – much to the delight of urban gardeners everywhere.